Please note: For the comfort and safety off guests and staff, NO PETS allowed on opening or closing days. Primary Camp Sunday 9:00-10:00 a.m. 10:00 a.m. Junior, Jr. High, Super Camps Monday 9:00-10:00 a.m. 10:00 a.m.
Rockin’ Raft Monday 9:00-10:00 a.m. 10:00 a.m.
Primary Camp Tuesday 9:00 a.m. 9:00 a.m. Junior, Jr. High, Super Camps Saturday 9:00 a.m. 9:00 a.m. Visits during camping sessions are discouraged and must be cleared through the Camp Office prior to arrival. 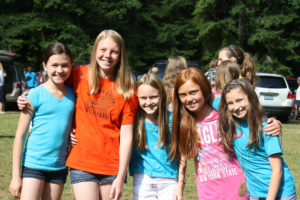 The Camp does not pre-assign campers to cabin groups. Cabin assignments are made on the first day of camp following the Opening Program. At that time, campers will have the opportunity to be with their friends. Please Note: Postage-due mail will be returned to sender. No mail delivery for Rockin’ Raft Camp. Mail received for a camper whose session has concluded will be returned to sender. If you would like to order any of these items, please indicate your desire on the registration form and include payment with your deposit. Please Note: If purchased after the first day of the session an additional fee of $3 will be added. Here is a list of what to bring. Please clearly mark all items with the camper’s name. Please use discretion in sending valuable or sentimental items. Trout Creek cannot take responsibility for lost or stolen items. Please Note: Trout Creek has a no electronic device/cell phone policy.